In this episode of Dubspot’s Wireless interview series, New York City DJ and Dub War founder David Quintiliani aka Dave Q sits down with our own Raz Mesinai for a chat about his events, musical influences, and the changing pace of music. Dave Q is a New York City DJ and founder of Dub War, the first dubstep night in the U.S. which became a portal for artists such as Kode 9, Mala, Loefah, Skream, Actress, Shackleton, and Ramadanman to expand their global audience. After the end of the seminal monthly club night in 2010, Dave established a new party series called Twisup and continues to bring new sounds from all over the world to New York City. In this conversation with Dubspot’s Raz Mesinai, Dave talks about his career in music, from playing bass in bands to DJing and influence of labels such as Warp Records and artists like Aphex Twin and Autechre. Dave also talks about, embracing new tempos and textures, incorporating Chicago juke and footwork in his sets, not fetishizing UK dubstep, the accelerated popularity and increasingly narrow definition of dubstep, and constantly expanding bass music universe. 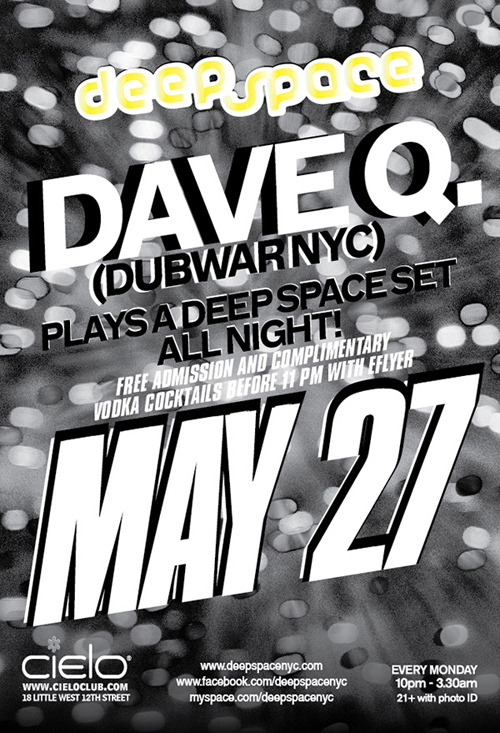 Next Monday, May 27, Dave Q will play a special all night set at Deep Space club night at Cielo! To get ready for this special occasion, listen to this live mix Dave and Raz recorded for Dubspot Podcast Series. Also make sure to check out our last interview with Dave Q, a written discussion with Mike Steyels from 2011.